No, didn’t get a new diamond necklace. Did get a lovely orchid from my lovie, and I did cook my lovie a delicious meal. It was all very lovie. . I actually attempted a very interesting dinner last night, cooked almost completely on the barbecue. I know, you think I’m crazy. But it’s been lovely weather in LA and I didn’t feel like making a mess of the kitchen. Thus, the grill was my solution. Plus my oven was very occupied by heart shaped cookies, so it made my life a little easier. First, I sauteed some diced onions and a little garlic in a cast iron skillet on the stove. Once translucent, I added a large bunch of washed red kale and some chard and sauteed. I transferred the entire skillet to the outdoor barbecue, placed it directly on the grill. After sauteeing a few minutes to start the greens wilting, I left it alone and moved on the starch and meat. I placed a piece of oiled tin foil on the grill and then topped the sheet with slices of ready made polenta. I know. Lazy me buying ready made! What can I say, I’m an easy date. 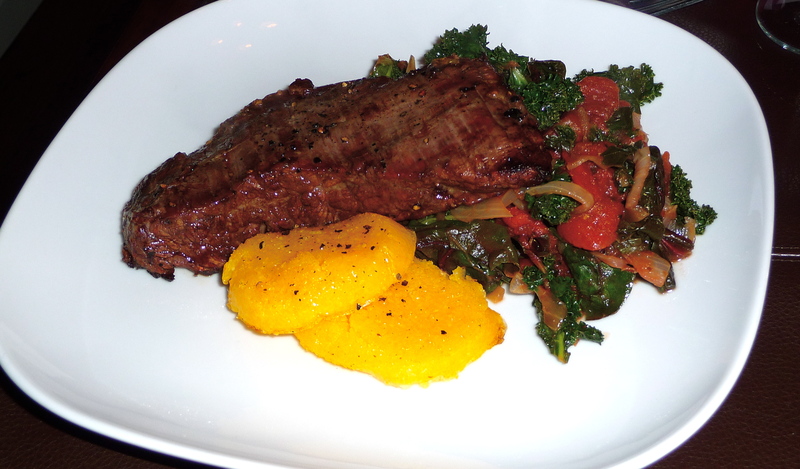 Next to the polenta I grilled two pieces of flank steak, seasoned very simply with olive oil, salt and pepper. Apparently I’m not only easy, I’m simple too. HOT. Within ten minutes, pretty much everything was ready and I plated almost directly from the grill. Hello, one pan dinner! Easy, indeed.